Last evening, May 1, our parish celebrated its feast day, the Feast of St. Philip. The evening included Holy Eucharist and a dedication and blessing of the newly completed labyrinth and prayer garden using the liturgy below. Through the ages, Almighty God has moved his people to set apart holy places for prayer and to recognize and celebrate God’s presence in those places. 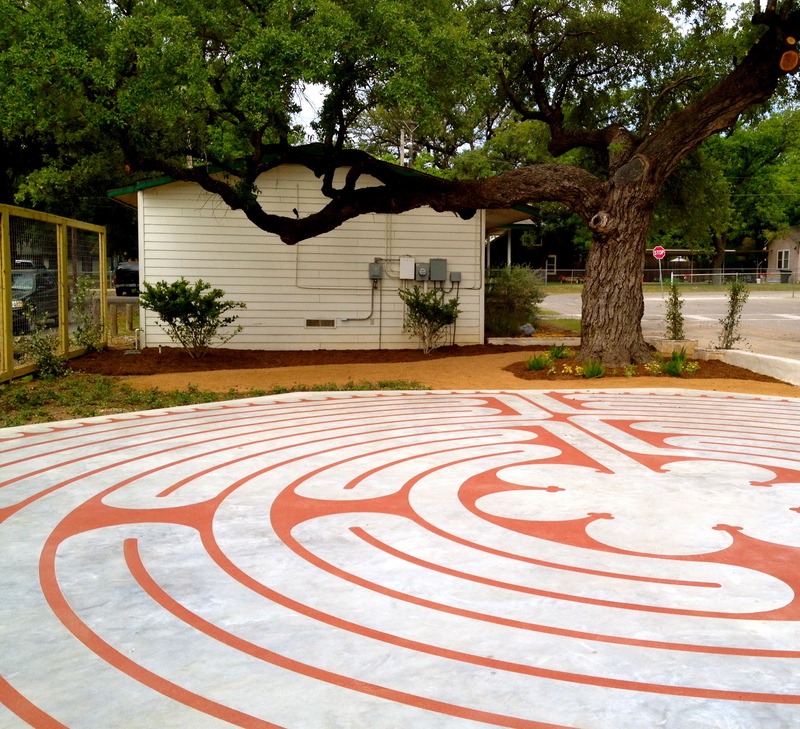 With gratitude and thanksgiving for this labyrinth and prayer garden, Camino Sagrado/Sacred Path, we are now gathered to dedicate and bless it in God’s Name. Almighty God, we thank you for the beauty of creation, for making us in your image and likeness, and for calling us to be your people and follow you on the path of holiness and life. We offer this work of human hands, Camino Sagrado/Sacred Path, to be set apart and blessed as a place of prayer and worship, discernment and discovery, healing and reconciliation, celebration and thanksgiving, to the praise and glory of your Name; through Jesus Christ our Lord. Amen. Be our companion in the way, kindle our hearts, and awaken hope. Accompany and pray for us. Lord, hear our prayer and be our guide. Bless to us, O God. All: The Lord went in front of them in a pillar of cloud by day, to lead them along the way, and in a pillar of fire by night, to give them light, so that they might travel by day and by night (Exodus 13:21). Almighty God, whose Son, Jesus Christ, said to us, “I am the way, the truth, and the life:” Bless and make this labyrinth to be a sacred path that reveals his way, his truth, and his life, that it may lead and guide us to you. In him be always near us that we may find you in this place. Through him draw us to you when we come to seek comfort and wisdom, to be supported and strengthened, to rejoice and give thanks. With him may we walk this path that we may be sanctified and made one with you and with one another. Send your holy angels to help and defend us on life’s journey. In our earthly pilgrimage may we always be surrounded and supported by the love, prayers, and witness of the Blessed Virgin Mary, Blessed Philip, and all your saints in heaven and on earth. All this we pray through Jesus Christ our Lord, who lives and reigns with you and the Holy Spirit, one God, for ever and ever. Amen. Celebrant: We give you thanks, O God, for the gifts of your people, and for the work of many hands, which have built Camino Sagrado/Sacred Path and beautified this space to be a place of prayer and contemplation. Accept and bless all we have done, and grant that in these earthly things we may behold the order and beauty of things heavenly; through Jesus Christ our Lord. Amen. Celebrant: The grace of our Lord Jesus Christ, and the love of God, and the fellowship of the Holy Spirit, be with us all evermore. Amen. Alleluia, alleluia. Let us go forth in the name of Christ. People: Thanks be to God. Alleluia, alleluia.